CALGARY — Discounts on Canadian crude oil widened to multi-year highs on Wednesday as oil and gas executives took turns at a conference pointing out Canada's competitiveness gap in attracting energy investors. "All of those things have culminated into a system that is completely overloaded," Pickering said. "Anything people can move out, they're moving out, but we've basically just got the perfect storm." He said the WCS differential grew to as much as US$48 per barrel on Wednesday morning, the highest since at least 2011, and the Edmonton Sweet differential was at US$27.50 per barrel, a multi-year high that's more than three times its typical size. On the sidelines of the Energy Roundtable conference in Calgary, meanwhile, CEO Kevin Neveu of Precision Drilling Corp. said the differentials are having an immediate chilling effect on companies' ability to fund drilling budgets in Canada. "It's proportionate to the cash flow. So if (a drilling customer) expected a netback of $50 Canadian or $55 or $60 and they're only getting $45 or $50, they'll adjust back to that outlook quickly, within the quarter," he said. In a speech later at the conference, Natural Resources Minister Amarjeet Sohi acknowledged there have been "setbacks" for the Canadian oil and gas sector, notably a court's overturning of the Trans Mountain pipeline expansion approval. But he also cited the signing of a free trade deal with the U.S. and Mexico and a final investment decision by partners in the $40-billion LNG Canada project as recent positives. He told reporters later when asked about high differentials that he feels "frustrated" that no new oil pipelines have been built to take Alberta resources to markets other than the United States. "The amount of revenue we are losing as a country because we don't have access to non-U.S. markets is absolutely unacceptable and we need to do better and we are committed to do better," he said. He defended Ottawa's decision not to appeal the Trans Mountain decision because that would take longer than bowing to the court's requirement to refer shipping issues to the National Energy Board and fill in gaps in Indigenous consultation on the pipeline. "Today, every well we drill in British Columbia, we pay over $100,000 in carbon tax just on the diesel used to drill and complete that well," he said during a speech at the conference. "Those products are largely moving to markets in the United States. In the United States, we don't pay a dollar of carbon tax." 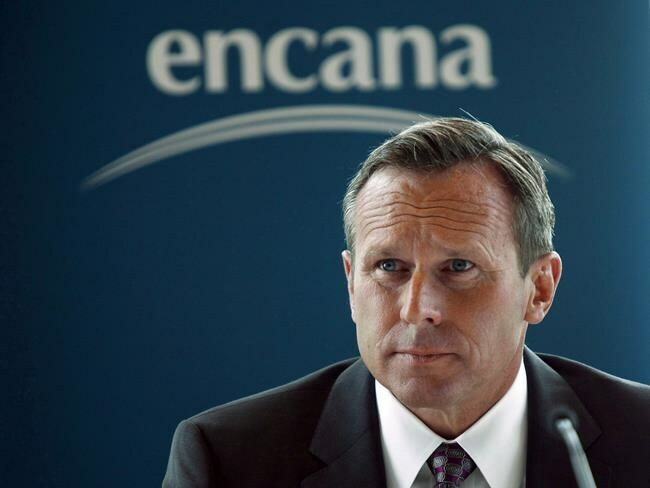 "As a Canadian, it's easy to get really down," said Ian Dundas, CEO of Enerplus Corp., a Calgary-based company with 90 per cent of its production in North Dakota and little in Canada. "We've let the Americans outcompete us and outregulate us and we find ourselves in this position." He said the solution is to stop making the situation worse — citing Ottawa's Bill C-69 to reform the NEB and its proposed clean fuel standards as examples of that — and start coming up with ways to help Canadian companies compete with U.S. rivals. He added he hopes next year's federal election encourages the public to discuss changes to national energy policies.